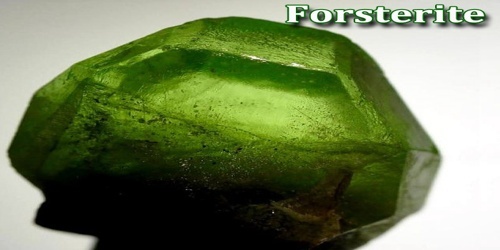 Forsterite is any of a group of magnesium iron silicates, (Mg,Fe)2SiO4, occurring in olive-green to gray-green masses as an important constituent of basic igneous rocks. It is isomorphous with the iron-rich end-member, fayalite. 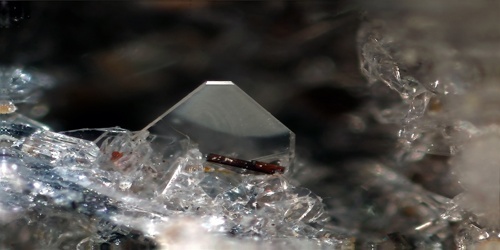 Forsterite crystallizes in the orthorhombic system (space group Pbnm) with cell parameters a 4.75 Å (0.475 nm), b 10.20 Å (1.020 nm) and c 5.98 Å (0.598 nm). Olivine, is not scientifically recognized as a separate mineral, but is nevertheless well-established. The mineral Tephroite (Mn2SiO4), which many consider a member of the Olivine group, forms a series with Forsterite. Forsterite and Olivine can be olive-green, light green, dark green, yellow-green, yellow-brown, and brown. Rarely white, gray, or orange. Pure Forsterite is colorless, but this is extremely rare. Fayalite is usually yellow-brown to brown. Forsterite, fayalite (Fe2SiO4) and tephroite (Mn2SiO4) are the end-members of the olivine solid solution series; other elements such as Ni and Ca substitute for Fe and Mg in olivine, but only in minor proportions in natural occurrences. 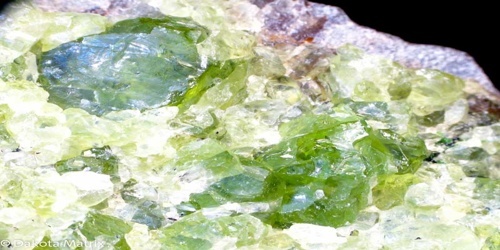 Other minerals such as monticellite (CaMgSiO4), an uncommon calcium-rich mineral, share the olivine structure, but solid solution between olivine and these other minerals is limited. Monticellite is found in contact metamorphosed dolomites. Forsterite is common in dunite, gabbros, diabase, basalts, and trachytes. Small amounts of fayalite are present in many volcanic rocks in which sodium is more common than potassium. The forsterite-fayalite minerals also occur in dolomitic limestones, marbles, and metamorphosed iron-rich sediments. These minerals are relatively infusible, not melting below 1,500 °C (2,700 °F), and are sometimes used in the manufacture of refractory brick. The mechanical properties of partially molten rock, such as their permeabilities and viscosities, are important properties in geological processes. 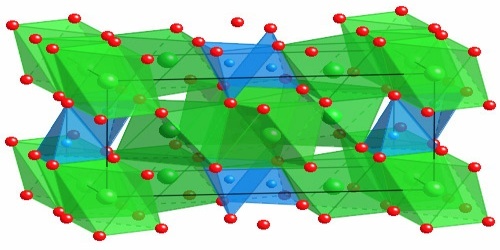 The characteristic structure of the forsterite-MgSiO3 liquid interfaces was observed in the simulations. In the layered structure of the altered surfaces, Si-rich and Mg-rich layers exist alternately in the vicinity of the crystal-liquid interfaces. The layered structure might be formed by the strength difference between Si-O covalent bonds and Mg-O ionic bonds. One of the important factors that can increase the portion of forsterite in the olivine solid solution is the ratio of iron(II) ions to iron(III) ions in the magma. As the iron(II) ions oxidize and become iron(III) ions, iron(III) ions cannot form olivine because of their 3+ charge. Forsterite is being currently studied as a potential biomaterial for implants owing to its superior mechanical properties.